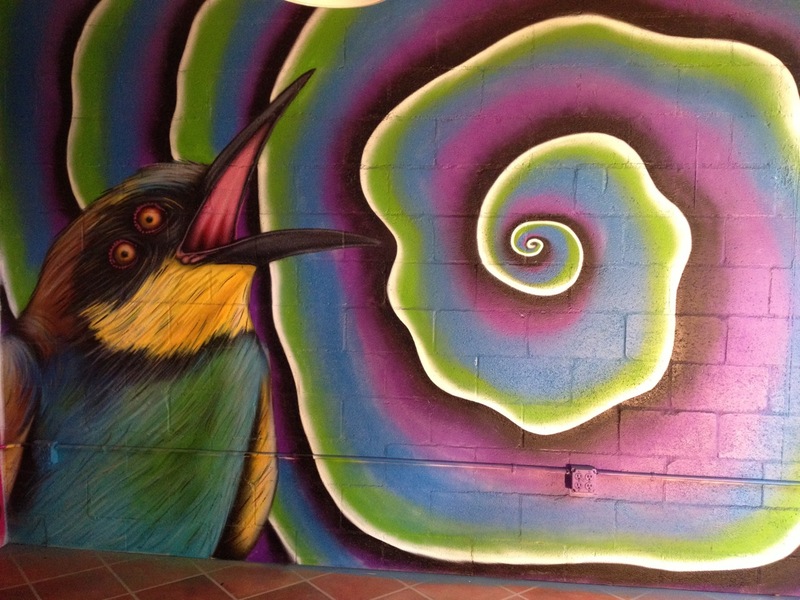 An article in the Bohemian about a graffiti stre et art show in Santa Rosa in an unused warehouse had me excited to view the latest social and political commentaries from street artists. What I found unsettled me in ways I am trying to sort out. Instead of a multicultural exhibit with roots in hip-hop, I found another display of white men. Not entirely, of course, but predominantly. I left angry that a vibrant movement initiated by people of color had been hijacked by white men. Maybe I should have thought “What marginalized artist is going to have access to the old Press Democrat printing building downtown in Santa Rosa?” But how much more satisfying if the white man who had that access and imagined a graffiti show in the space had turned the show over to a group with people of color and women well represented. The real giveaway to the whiteness of the show was the lack of subversiveness. Many of the artworks were powerful, beautiful, disturbing, playful, colorful. The space filled with energy from both the excited viewers and the creativity displayed. But for me, the works fell flat, because they did not stimulate me with social insights or make visual thoughts I may have held about injustices around me. The ability to slyly or angrily or poetically comment on oppression and resistance is always at the heart of street art that moves me. There were two expressly political works I noticed. One was the famous Obama poster with his name prefaced by “Drone” and splashed with blood. I took it to be a play on “drone” as in “worker bee,” one without real power and tied to the use of drones to kill people. The other showed an outline of a fully covered woman, with only a slot for the eyes not rendered in black. 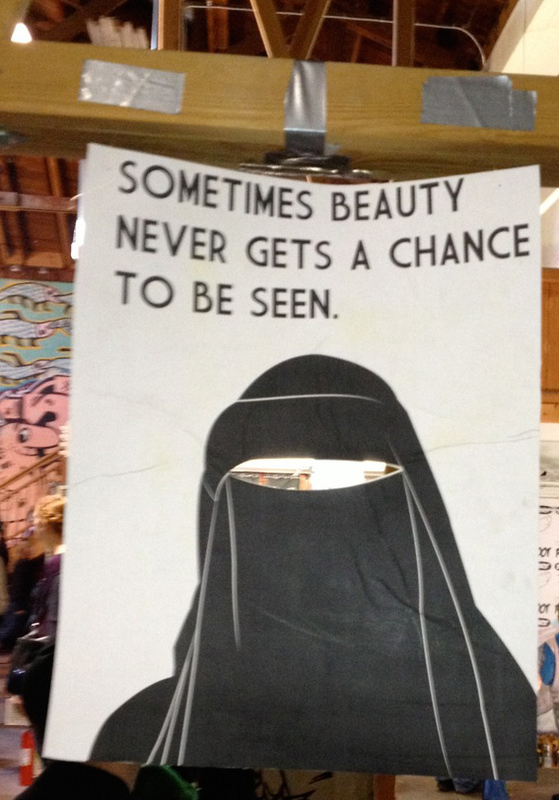 The caption was “Sometimes beauty never gets a chance to be seen.” Many people see the beauty (not limited to physical beauty) of covered women, even those who submit to cultural and political pressures in wearing the veil against their own desires. The piece seemed an insult to Muslim women although it was meant to be pro-woman. It was exciting to see such a big crowd turn out for the show (there was a line down the block when I arrived just after it opened). The disappointment descended as I kept looking for the stimulation I expected and gradually turned to anger when I realized that this show was not speaking truth to power and the voices I had come to hear were excluded. I guess it’s back to the streets.